Finally a voice of reason arises from the din. School safety transcends debates on metal detectors and surveillance cameras. Within the walls of our schools exists the unspoken realm of emotional safety, or the lack there of. Dr. Bluestein explores the systemic dimensions of emotional safety in a holistic and detailed fashion. She challenges all of us who work in education to take a look around us, and to introspectively evaluate how we contribute to, or threaten, our students’ emotional state of well being. Thoroughly researched, skillfully written, and vitally important, this book can and should have a profound impact on the way we educate our children. There are literally hundreds of practical ideas for educators who want to prevent violence, improve learning, and promote student responsible behavior. Enlightening and inspiring, this book should be a part of every teacher’s professional library. educator and president, Quality Educational Programs, Inc.and Quality Educational Media, Inc. This book continues to make Dr. Bluestein one of the leading educators of the new century. 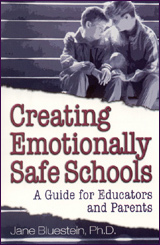 This newest book includes all the necessary strategies for creating emotionally safe schools. It is a must-read for anyone working with youth in today’s schools. Finally! A book that clearly and definitively tells us how to create safe school environments without metal detectors. Dr. Bluestein has done a brilliant job synthesizing cutting-edge research to tell us what we need to do to help students feel emotionally and physically safe so they can devote their energy to what they need to do: LEARN! A copy of Creating Emotionally Safe Schools should be on the desk of every school principal—because this book will save lives. I highly recommend it. Safety is such an important issue in schools today. Jane Bluestein, a masterful writer and insightful educator, has brought together an understanding of how to assure safety in schools, both for students and educators. This profound work is a must for parents and educators. Jane Bluestein takes her readers to a new educational level. By living, learning, listening and loving our students, she comes to “know” that our schools are emotionally unsafe places to learn. In this bold yet scholarly book, she leads the way for contemporary classrooms that foster responsible behavior. Her school “house” is constructed with her own effective teaching practices, which show us that we don’t have to be learning and living on the edge of school violence and crisis. Read, reflect and renew your positive approaches to successful learning the Bluestein way. Emotional safety in American schools is not only about guns and violence and getting kids to and from school in one piece but also about learning styles, social interactions, discipline, and the roles schools assume in our society and economy. Bluestein, the award-winning author of such works as 21st Century Discipline, Being a Successful Teacher, and The Parent’s Book of Lists, sets out to highlight the core issues and dynamics that keep feeding the headlines of violence or vandalism. Offering examples of schools where children and adults are reported to feel “emotionally” safe, Bluestein discusses ways in which any academic institution can become a safer place. Chapter notes and a long list of recommended resources make this a useful reference for anyone interested in school reform, educational growth, and current educational perspectives. A realistic look at what is wrong with our schools, this timely book belongs in academic, public, and school libraries. Educational counselor Jane Bluestein (21st Century Discipline) challenges educators, parents, communities and corporate citizens to consider school safety beyond the presence or absence of violence. School safety can be measured psychologically, she claims, and is influenced by everything from a school system that does not respect the expertise and individual styles of its teachers to teachers who use grades and pop quizzes to ridicule slow learners and students who tease and harass even one classmate. In Creating Emotionally Safe Schools: A Guide for Educators and Parents, Bluestein brings together social, biological, educational and environmental perspectives in a weighty and timely book. Creating Emotionally Safe Schools, by Dr. Jane Bluestein, investigates the 20 most important topics to be addressed in schools today. We have known for a while now that there must be emotional safety in schools in order for real learning to take place. This book cried out to be written, with topics such as bullying, memory and emotion, violence, discrimination and the need for belonging, and so very much more. This book is a MUST READ for all who are concerned with improved and more effective schools. Jane Bluestein is a writer who knows the truly important issues to which schools in America must pay attention. This book changed the way I think about things. To start out with, I have had a heck of a time in high school, being teased relentlessly… so when I saw this at the bookstore where I worked at the time, I put it aside to buy later…. then I bought it, read it, and went crazy… every single thing that bothered me in High School was addressed in here. This book has a great title, this book has great content, and this book is an essential in any library, personal or otherwise. If you love your kids and see this book lying around, it is a safe bet that youw will pick it up and benefit greatly from it!!!! Honestly, there are few books out there that say what this one says… and the way it is said. Jane is a gem, she is a national treasure for writing this book! For more information about this book, click here! Use your credit card or PayPal account to order The Win-Win Classroom through a secure server online. Click here to go to the product page. Products are listed alphabetically. Free shipping on all prepaid U.S. orders. International visitors: 10% discount on all prepaid merchandise (excluding downloads). For more information, click here. Ask for an autograph. It’s free, too! Need an order form you can print out and mail in? Click here. Or call 505-323-9044 to order. Click here for the entire bibliography from this book. Sale items: Click for new, used, and slightly damaged books at exceptional prices or to see if there is a copy of this item at a reduced price.